Picking up from where the last 'Fashion' post left off: comfortable dressing! The real test of comfortable yet stylish dressing comes when traveling. While it should not be a prerequisite to look 'cute' while traveling, it sure cannot hurt. My mantra, no matter what occasion or location, always remains the same: Comfort is key! 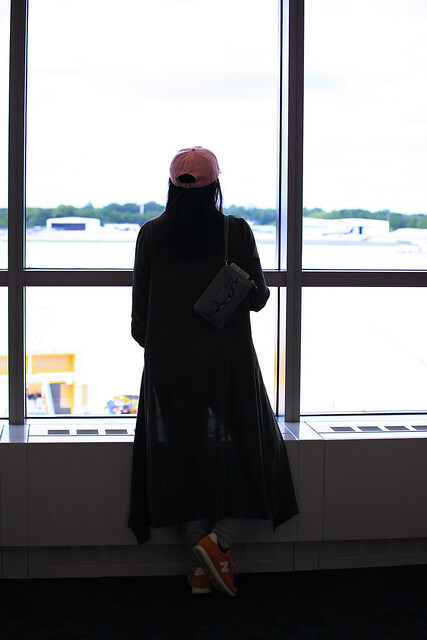 However, all the rules and regulations while traveling also adds another dimension to airplane travel: practical and efficient for security check along with being comfortable. One thing that does get on my nerves is when you are in a long security check line where TSA PRE CHECK is not available and the people ahead of you are not prepared enough. I sure try my best to be as efficiently dressed as possible to get through the security without letting any sensors go off (Monica much?). When you’re going to be sitting for hours in a cramped airplane you need to make sure you are wearing soft, comfy pants that are a little bit loose or have some good stretch to them. There’s nothing worse than stiff, tight pants that squeeze your thighs and dig into your crotch as you sit stuffed into a tiny seat. If you want to wear jeans, then the best kind are the ones with a relaxed boyfriend cut, or if you like skinny jeans be sure they have some spandex in them. I’d suggest against wearing any leggings that are SUPER tight. Your legs will swell slightly as you fly because of the altitude and that can make tight clothes pretty uncomfortable at 30,000 feet! A soft, light top is what you need to feel comfy and stress-free. It can be cotton, silk, or a thin knit. The only thing to stay away from is any material that wrinkles easily. I like tops with long sleeves or 3/4 length sleeves because I find airplanes can get very cold. If your body temperature fluctuates then layering a camisole under a longer sleeved top is a good idea. Some airport have their air-conditioning set too high, some have it set too low. Same for the airplanes. Regardless for the weather outside, you have no idea how it will be one you are inside the airport and aircraft. That's where layers come in. A big scarf or a light cashmere wrap is a must have in my books. Even with styling the look with a cardigan or duster (like there) I always have one in my handbag. Scarves are the BEST accessory for traveling by plane because they make casual outfits look a little more vibrant and “together” PLUS you can bunch them up into a comfy pillow or neck support if you want to nap en route to your destination. Two birds with one stone! A long cardigan is good too, or even a light jacket works well. The amount of walking you have to do in airports these days is crazy. Walk from the parking to the check-in to baggage drop off, to the customs, then security and finally to the plane. Did I sign up for a marathon or a flight? Kudos to you if you can 'comfortably' do it in heels. I sure cannot and neither would I ever want to. Thankfully sneakers are in fashion lately plus there are so many other cute flats options out there nowadays. Finally, to your arm candy! I will confess, I am flexible in this area. Sometimes I carry a tote, sometimes a backpack and other times just a travel pouch with essential and rest in the hand-luggage. But as a rule-of-thumb is it always good to stay clear of any bags with hardware such as studs, and chains. Not only would they add unnecessary weight but could also get stuck to other fabrics and things while you are on-the-go. One of my recent finds have been the Diana Punch by Lidia May. I carried it on my recent trip and this sleek looking pouch didn't only old my passport, credit cards, ID, boarding pass, phone but I was also able to carry a pen, comb, travel size hand-creme and a lip gloss in there. Whaaat? I know, right? During the flight I didn't have to reach into my hand luggage once because everything I needed was in this tiny little travel pouch. 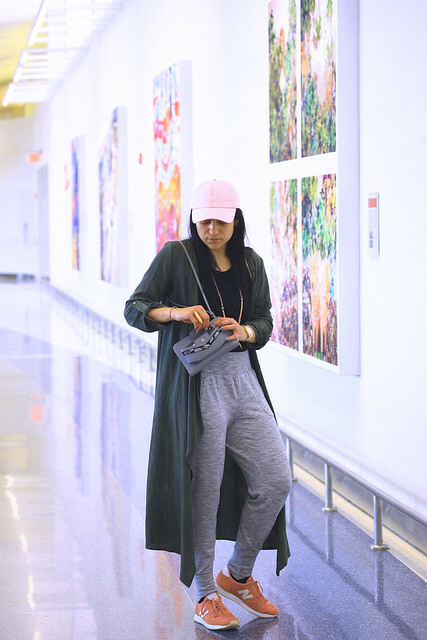 Looking so comfy in your airport style! That's my kind of style as well, cute and comfy! All great tips for when traveling and loving your travel pouch. SO easy to carry with you and look fab at the same time. These are great tips. I love dressing comfortable on a plane, and I love your purse!! 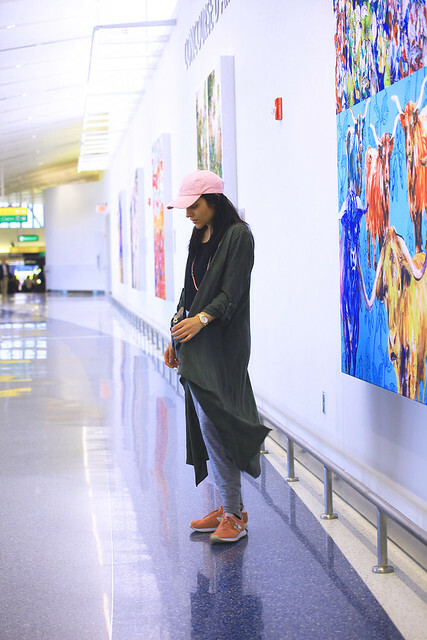 Comfy clothing is always a good idea when traveling. I also love that you mentioned wrinkle-free clothing, that's a must as well. This is my kind of travel outfit! I always wear leggings and a loose tee. Gotta be comfortable! 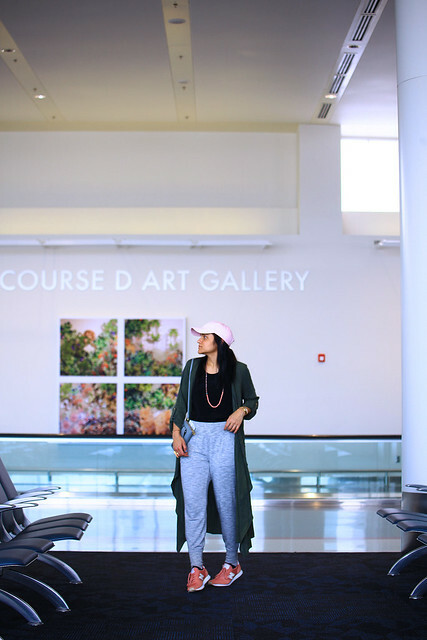 These pants look like the perfect travel piece! I usually like to dress up some and look my best when I arrive. I love the jogger pants. Layering is such a great tip because you go from hot to cold so fast when traveling. I always try to be as comfortable as I can when I travel. Wearing comfortable shoes is important. I agree with you wearing comfy bottoms is also important too. Thanks for this list. I found it helpful. I'm 100% with you on wearing loose fitting clothes when you fly. Besides how uncomfortable tight things are you also run the risk of getting deep vein thrombosis, especially on the longer trips, and that's no fun. Loving the little Diana Punch bags too. It's hard to believe that it can carry all that stuff and it looks so cool too. I am feeling this style for travel! I am a comfort traveller before I consider the style and I agree with you about bags with chains,studs and such also because they love to set the security machines off! I've had that happen so many times! Love this look! I am all for being comfortable while traveling! These are great tips gal! You look perfectly cute and comfy! The pants look so comfy. We live in lularoe leggings, but these look as comforable as them. This is a really helpful post Tanvi, you look so stylish even in your comfortable clothes! I am loving those New Balance trainers I am off to find some for me! I agree - comfort is definitely key when it comes to traveling! Loving that little pouch to keep everything important in place! These are great tips. I always wear a shoe with a tread and covered toes because, heaven forbid, should the plane go down, you're NOT gonna want sandals or flats on the wing of that plane. I always take a duster type sweater, too. I'm always cold on the plane haha. These are fabulous tips for traveling! Your outfit looks so cute and stylish yet super comfortable too! These are such great tips for travel!! Such great tips. Thanks for sharing these awesome tips. Hoping to see more from you. Your travel look is perfect! Totally agree with wearing a shirt that doesn't wrinkle! That's the WORST! I'll all about comfort when flying! The less skin touching the seats, the better, ha! Such a perfect airport look! Love the pants! This sounds like a good list of rules for my everyday life! You look super cute and comfortable too, and I'm totally loving that bag!